Folkston, GA-_The 2005 October swamp trip had the p ut-in at Stephen Foster, the first night at Floyd’s Island, the second night at Canal Run shelter, and take-out at Stephen Foster. Despite the bad write-ups the trail receives in canoe guides, it proved to be a marvelous route. Unfortunately, only Donald May, Hamp Chauncey, Donald May, and Charlie Stines made that trip. Charlie decided to book it again for the October 2006 and did so. After the trail was reserved, the swamp personnel called to say that the water was too low to approach Floyd’s Island from the west side, to put-in and take-out would have to be at Suwannee Canal Recreation Area. This did away with the most scenic parts of the trip--the trip through the Middle Fork Run and Minnie’s Lake, plus the narrow trail from the Canal Run shelter to Billy’s Lake. Charlie asked if the trip from Suwannee Canal to Round Top and Floyd’s Island might be a vailable, but it was not. However, Judy from the swamp office did promise that the Fellow Travelers could have it should those holding the permit cancel. About a week before the trip Judy called to say that indeed the trail to Round Top and Floyd’s Island would be available. She warned that the ingress to Floyd’s Isalnd from the east might involve pulling the canoes through about a hundred yards of muck and mud. On Tuesday before the trip was to begin on Thursday, Judy again called to say that it was impossible to make it to Floyd’s Island but that the permit could be changed to allow put-in at Suwannee Canal Recreation area, first night at Round Top, and second night at Canal Run shelter with take-out at Suwannee Canal Recreation Area. That being what was available, Charlie agreed to take it. Judy warned that it might be difficu lt making it to Round Top due to low water. Paula Allen called to say that she could not come after all. Art Shelfer wimped out as well. On Wednesday Charlie booked into Folkston’s Western Motel. Rick Metz and Harry Selby arrived shortly thereafter, and the three went for supper at the Okefenokee Cafe. Rick had his first meal of alligator tail. Rick and Harry are both Lockheed engineers, but Rick lives in Kennesaw and Harry lives in Palmdale, California. This would be the first Fellow Traveler for either, and they had met none of the group. The only contact had been by internet and telephone. However, both had been through the swamp on previous occasions and both are veterans of the Boundary Waters canoe area. Roy and David Moye arrived later on Wednesday night. Roy, David, Harry, and Charlie had breakfast at the Family Restaurant before heading out to put-in on Thursday morning. Hamp Chauncey would not arrive until the time to put in at Suwannee Canal Recreation Area. The October weather was ideal. The canoes were loaded. The Moyes took the red Mohawk Ranger, Hamp took his Solo Plus, Harry and Rick used the Penobscot 17 (Gunn Boat), and Charlie soloed the Prism. A curious alligator watched as the boats were manned. The paddle was underway by about eight thirty. Paddling was easy down the canal, and alligators were out in force, although most of them only poked their eyes and noses out of the water. There were a lot of birds along the canal including anhingas, herons, hawks, an osprey, woodpeckers, and songbirds. The group reached the Coffee Bay day use shelter before eleven and took a good long break. Rick caught some fish but threw them back. Charlie demonstrated his major award folding saw, but it took Rick’s engineering skills to figure how to assemble it. Roy almost started a fight with David when he took the blade and swatted a yellow fly on David’s leg. There were th ousands of yellow flies there. Althoug h it was quite early in the day, everyon e ate the assorted snacks for lunch. The one-eyed alligator was not to be seen, but a smaller one was there. The junction of the purple trail was reached at 12:45, and the entrance was guarded by two alligators. 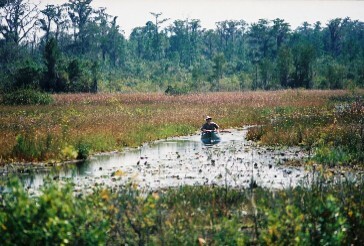 It was a short break and then the group began paddling through Chase Prairie. The paddling was not as tough as Judy had led the group. The excitement of the trip happened when Charlie was leading the pack and an alligator emerged from underwater and slapped the side of the canoe. There was no damage, but Charlie was wetted down. to expect, but the water was low. The prairie was alive with birds, including lots of wood storks, a few sandhill cranes, herons, egrets, and ducks. The autumn wildflowers were exceptionally pretty. Trumpet and hooded pitcher plants were abundant. Again, the alligator population was dense. It was about 2:10 PM when the Round Top shelter was reached. The paddle there had not been overly difficult. The first thing everyone wanted to do was to put up the folding chairs and take a rest. There were two alligators living at the shelter, and they made a lot of noise underneath the platform. Someone surmised the noises indicated the beasts had been eating beans. There were a lot of sugar ants on the platform. The yellow flies were not as thick as at Coffee Bay, but insect repellent was needed. A large great blue heron was totally unimpressed by the visitors and amused everyone attempting to catch fish and frogs. The gang also got to see green herons and a night heron. No one tried fishing, but a catfish did jump into one of the canoes. It made a tremendous noise. Hamp managed to get it out of the boat with tongs and place it back into the swamp where in all probablility one of the alligators promptly ate it. Charlie was in charge of Thursday supper and it was simple beef stew prepared by Diane ahead of time. It only had to be warmed. There were also corm bread muffins cooked before the trip by the King. It was a good enough supper and there was not much to clean up. After supper the six men sat around talking and watching the sun set and the full moon rise over Chase Prairie. The temperature was very pleasant, and there was a gently breeze. Bugs were not a big problem after dark. Eventually everyone went to bed. Charlie and Hamp elected to sleep without tents, but Hamp had a change of heart sometime during the night. The rookies, Harry and Rick, were breakfast cooks. The fare was breakfast burritos. and the newcomers truly tried to equal a Moye breakfast. Hamp used Rick’s net and caught a small fish and a frog, but he released them. The group was paddling away about nine. The remainder of the purple trail was about like the Thursday paddle. 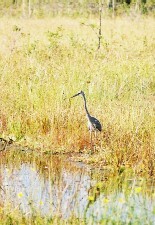 Again there were lots of birds and alligators, but only one pair of sandhill cranes. There were a lot of woodstorks. At 10:40 everyone arrived at the junction of the blue trail. From that point it is less than two miles to the Canal Run shelter, so the men expected to eat lunch at the shelter. Rick tried without success to catch a fish as everyone took a rest break. The blue trail from the junction of the purple trail to the junction of the orange trail at Suwannee Canal is a truly beautiful part of the swamp. The terrain alternates between prairie and woods, and the reflective water goes through a couple of nice pond areas. The travelers were at the Canal Run shelter before noon. The yellow flies were still a problem. After eating goodies no one exhibited lots of ambition or energy. Hamp did take a short canoe ride. A few tried fishing but there were no bites. The Canal Run shelter, like many of the other platforms, hosts a resident alligator. This one kept hanging around hoping fruitlessly to be fed. Hamp prepared a supper of beef stew in the Dutch oven, and he also made rice and hoe cakes. Although he and Charlie both made beef stew, everyone agreed before tasting either to tell Diane that hers was the better. However, Hamp also made a peach cobbler in the Dutch oven and Roy was very critical of Diane for not sending dessert. Hamp also built a decent campfire. After supper there was a lot of conversation and a few lies. Harry tried to explain to Charlie the working of an automotive differential and was partially successful. Topics ranged from education to literature to automobiles but somehow politics and religions were not raised, hence the trip was devoid of any knife fights. Saturday morning was cool, and no one was out of bed before about seven thirty. Roy upheld the Moye standard by serving everyone biscuits, gravy, link sausage, and yellow eggs. There were no grits. It was not long before the tents were down, the canoes loaded, and the final voyage began. The paddle up the canal was uneventful. Rick could catch no fish. There were still a fair number of alligators. It was almost twelve when the paddlers arrived at Coffee Bay. The alligator was still there, but this time the fish were not biting. (The yellow flies were, though.) At that point the group had not seen a single person since put-in. After leaving Coffee Bay there were several other people on the water, including a group headed for Round Top and another for Canal Run shelter. There were a lot of alligators, and some were out of the water sunning on the banks. The trip ended a little after two at Suwannee Canal Recreation Area. Rick and Harry were exceptional rookies. The entire trip was great. It is not the preferred route, but due to the low water it was all that was available. It is always a treat to watch the sun and moon at Round Top, and few trips have yielded more bird and alligator sightings.